The wait is finally over, Royal Pirates will be bringing their latest album <3.3> to Malaysia. 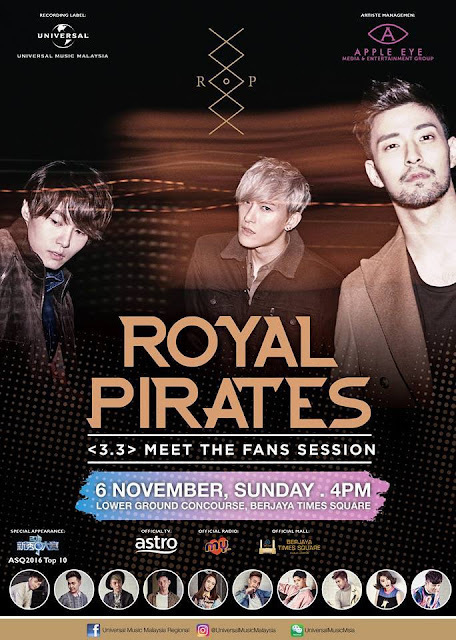 Royal Pirates will be meeting their Malaysian fans on 6 November 2016 (Sunday) at LG, Berjaya Times Square, Kuala Lumpur through their one and only Meet The Fans Session. Over a year since their second EP, Royal Pirates is back with <3.3>. Working with producer Jae Chong, the Korean-American band has crafted a sophisticated rock album that integrates various genres. A modern rock number with breakbeat and EDM elements, the title song Run Away carries a positive message about overcoming difficulties. Meanwhile, Too Fast brings retro 80s-style elements to 2015. Other new songs include the R&B rock ballad Without You and Let U Go, which fuses 80s retro modern rock sound with electronic dance music. Royal Pirates will be one of the guest judges from Astro Star Quest 2016. On 6 November, Astro Star Quest 2016 TOP 10 will appear at Royal Pirates meet the fans session. The album - <3.3> has been released in Malaysia and the physical album will be sold at the meet the fans session. Fans that purchase Royal Pirates latest album <3.3> and bring along the album to their ‘Meet the Fans’ session is entitled to get it autographed by all the three members of Royal Pirates!